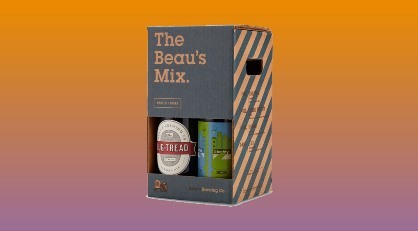 The 2018 Beau’s Mix Pack winter selection covers all your flavour needs with the original Lug-Tread, Double Identity IPA, Osmium Wee Heavy, and the perennial favourite, E.S.B. Farm Table Series. Perfect for sharing during the winter months, this will be well received by any craft beer aficionado. All the beers are made with certified organic grains and hops and local spring water. Limited availability. After the price of West Texas Intermediate Crude (WTI) oil cratered in the summer of 2014 from a high of $107.04 US/barrel to a low of $26.55 US/barrel on Jan 20, 2016, many of us in Alberta have endured a long period of pain and hardship. Businesses like us, in the discretionary retail sector, did not escape the carnage of an economy so reliant on a single commodity. In these tough economic times, the partners believe that it is even more important now to help others if we can. With this backdrop in mind, deVine Wines is pleased to announce its support for Edmonton’s Food Bank. 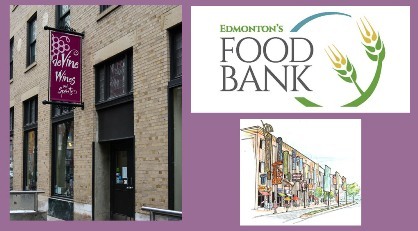 You can learn more about Edmonton’s Food Bank here..
During difficult economic times, funding for the arts is often the first to be cut. We at deVine Wines believes that art, in its many forms, is worthy of support, nurturing and creation, at all points of a business cycle. Therefore, we have chosen to support the Neon Sign Museum as our second Charity of Choice and to launch a new program called Walls Alive. Our goal in supporting the Neon Sign Museum is to raise money to recreate one of Edmonton’s lost iconic neon signs, that of the Seven Seas Restaurant. You can learn more about the Neon Sign Museum here..
You can view the lost Seven Seas neon sign here in black and white..
A colorized version can be found here..
Charitable works does not always revolve around raising funds for recipient organizations or groups. At times, groups may simply need support from the community to showcase their works. This is certainly the case for many aspiring visual artists. Walls Alive is a proposed initiative where businesses can donate their wall space to a visual artist to showcase his or her works. In essence, the business is supplying a venue for the artist to display art and providing an opportunity to connect artist with patron. deVine Wines has donated wall space to many artist since our doors first opened in 2004. The Walls Alive program aims to knit together other businesses on 104th-Street that share a likeminded view of helping out visual artist. The partners at deVine Wines plan to reach out to their neighbors on 104th-St. to see if a cohesive visual arts display program can be developed for the street. Hopefully, this initiative will lead to an “Art Walk” type event found in many other neighborhoods in the city. Our first Walls Alive partnership has just been established. deVine Wines will showcase the works of visual artist Nosheen Pervez on its walls and at future upcoming events. Nosheen will be on hand during the November 3, 2018 Great Whiskies of the World Fundraiser and Art Show. As well, Nosheen will donate a piece of her work to the online silent auction in support of Edmonton’s Food Bank. Please visit Nosheen’s website here to view her portfolio and get more information about her inspirations. 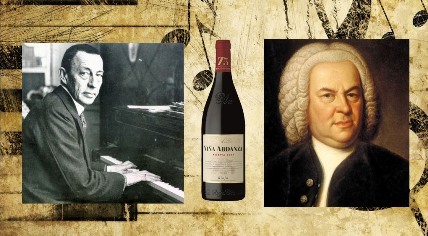 Do you ever wonder if classical music changes our perception of wine? Hogwash you say, but try asking several winemakers around the world, who play classical music in surround sound speakers while their wines are fermenting or over open fields. Or that of Italian winemaker Giancarlo Cignozzi of Il Paradiso di Frassina in Montalcino, who serenades his Sangiovese grapes with the music of Mozart…I find I have classics on all the time when I entertain, so perhaps the effect is all subliminal? In this our second annual “Classic”al Pairings event, we’ll be tasting seven wines which we think match up with music themes or compositions authored by seven different classical music composers. What are the connections and tie-in’s between what you’re drinking and what you’re hearing and the composer? Well, you’ll have to attend to find out, but it will be a smorgasbord for your senses – it’s an evening out for your nose, mouth, heart, brain and ears…Only 34 spots available for this sit-down event. Valentines is next Wednesday, so here are a few recommendations to treat your loved one for this special occasion. Included are some rec’s for pink bubbles, some craft beer, chocolate and some aptly named love related wines. Much more options are available, just drop in the store this weekend for personal assistance. Great Bordeaux in the Magnum (1.5L) format are very hard to come by, you practically have to buy them as Futures. 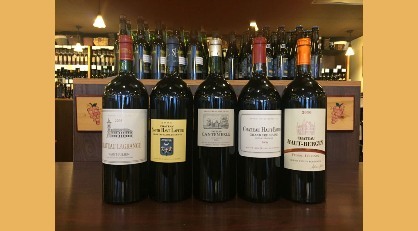 We are featuring five magnums that we have held back and now offering them for sale. All hail from great vintages such as 2005 (which is approaching maturity), as well as 2009 and 2010, two other great vintages. Impress your guests with a big bottle Bordeaux!! Very limited availability.